USCharters.org: Two SABIS® charter schools ranked among the “Best High Schools" in the U.S.
Two SABIS® charter schools ranked among the “Best High Schools" in the U.S.
April 26, 2013: Once again, U.S. News and World Report has ranked two SABIS® schools in the U.S. amongst the best high schools in the country. 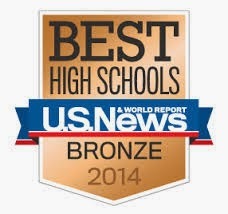 The SABIS® International Charter School in Springfield, Massachusetts, and the International Academy of Flint in Flint, Michigan, received silver and bronze medal rankings, respectively, according to the “Best High Schools Ranking” for 2013. To produce the 2013 Best High Schools rankings, U.S. News teamed up with the Washington D.C.-based American Institutes for Research (AIR), one of the largest behavioral and social science research organizations in the world. Over 21,000 public high schools in 49 states and the District of Columbia were analyzed and ranked based on a 3-step process. First, each school’s student performance was analyzed to see if they were performing better than statistically expected for an average student in the state. Second, results of each school’s least-advantaged students (African-American, Hispanic, and low-income) were analyzed to determine performance better than average for the same demographics in the state. Third, and finally, the school’s College Readiness Index (CRI) was calculated based on the number of students who took at least one AP or IB test before or during their senior year, divided by the number of 12th graders for that year. Among the 32 charter schools recognized in Massachusetts, SABIS® International ranked 7th, with a CRI of 21.3. The school, which is a perennial award winner, was ranked 1,729th nationally. Of the charter schools in Massachusetts to make the list, 6 received gold, SABIS® International received the only silver award, and 25 received a bronze ranking. In the SABIS® member school in Flint, Michigan, news of the release of the U.S. News rankings was received with an equal amount of enthusiasm. The International Academy of Flint was listed among the bronze medal winners. The school ranked 8th among the 77 charter schools in Michigan that made the Best High Schools list. The International Academy was founded in 1999 and currently enrolls 1,196 students in grades K-12. Ninety (90) percent of the school's students are minorities and 86% are from economically-disadvantaged families. SABIS® International and International Academy both implement the proven SABIS® Educational System, a comprehensive educational program that prepares students with a solid academic foundation and the skills needed to achieve success in a changing world. To view the two SABIS® schools’ U.S. News and World Report listing, visit http://bit.ly/15EH0f9 (International Academy) and http://bit.ly/14N7Ima (SABIS® International). To learn more about the SABIS® Educational System, visit www.sabis.net or www.sabis.net/licensing.